Mitt Romney's lead in the race for the Republican nomination for president is collapsing before his eyes as former House Speaker Newt Gingrich is quickly gaining on the former Massachusetts governor. 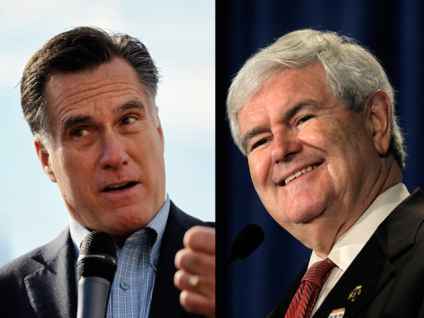 Among likely registered Republican voters, Romney is leading nationally with 30 percent, compared to 20 percent for Gingrich, according to Gallup's daily tracking poll released Friday. A day earlier, Romney's lead was 17 points. Five days earlier, it was 23 points. Gallup editor-in-chief Frank Newport told CBS News Political Hotsheet that the 2012 campaign is more volatile than typical election years and is a "fascinating saga." Newport said candidates have been "up and down, more than we've ever seen before. Republicans are not locked in this year." The poll results encompass voters' position between January 15th and January 19th, a five-day stretch that includes the withdrawals of both Texas Gov. Rick Perry (Thursday) and former Utah Gov. Jon Huntsman (Monday). There were also a pair of debates in South Carolina during that time, and Gingrich performed strongly in both events. Gingrich received a standing ovation for slamming the national media after CNN's John King asked about an explosive report his second wife had accused him of seeking an open marriage with her before they later divorced so he could marry the other woman, Callista, who is now his third wife. Romney struggled in both debates and was forced to play defense in response to moderator questions and candidate attacks about his tax returns, abortion and his role in shaping health care in Massachusetts. This is a good week for Gingrich, according to election analyst Nate Silver who analyzed a variety of polls released this week in South Carolina, and he surmised that Gingrich is in a strong position ahead of primary day Saturday. "The FiveThirtyEight forecast model, trying to evaluate all of this information as objectively as it can, sees substantial momentum" for Gingrich, Silver wrote on his FiveThirtyEight blog on the New York Times website.